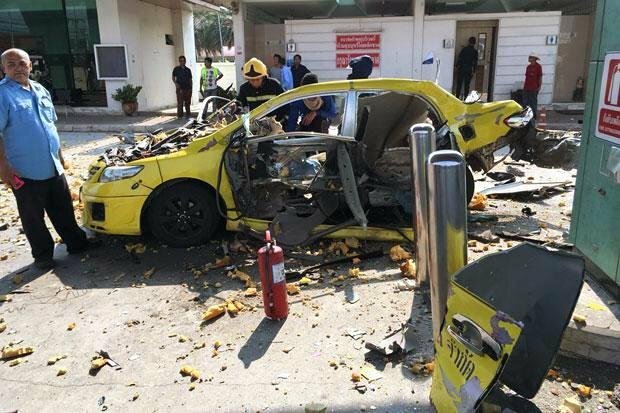 SAMUT PRAKAN: Experts have been called in to determine what caused the fuel cylinder of a natural-gas powered taxi to explode at a filling station in Bang Phli district on Monday, injuring three people. Pol Maj Gen Ampol Buarabporn, commissioner of the Provincial Police Region 1, inspected the blast scene, a natural gas pump operated by Royal Golden Dragon on Soi Wat Sri Waree Noi in tambon Bang Chalong, on Tuesday morning. He said investigators still had no idea why the explosion occurred. "Such incidents have happened before. I set up a panel to carefully investigate the cause. All relevant factors must be looked at, the taxi, the station and its staff. We must determine the cause in the interest of public safety," Pol Maj Gen Ampol said. Experts from the Energy Ministry and engineers from PTT Plc had joined the investigation, he said. The cab's compressed natural gas cylinder exploded about 2.30pm on Monday. Witnesses said the blast occurred when taxi driver Wichai Buadok, 45, got out of his taxi to pay for the gas. Mr Wichai was seriously injured by the explosion, which tore the taxi apart. Two employees of the gas station were also hurt and another taxi and gas pumps damaged. Raise hands all those who've seen people smoking in close proximity to petrol/gas refilling activities . I've seen on three different occasions, Somchais happily smoking at gas stations, each time I was moved to leave with haste.